We've all been there. The biggest animal of your life appears right in front of you at night and then...you lose it. It's an inevitable part of night hunting even if you're an expert. Nobody wants to miss their shot. At Sniper Hog Lights, whether you're a seasoned night hunter or brand new to night hunting, we've got bow hunting lights that'll improve your night hunting tremendously. Our bow mounted lights screw easily onto your bow right where your stabilizer would go. Quickly switch from spot beam to flood beam to avoid scaring your intended target with too bright of light. Our bow mounted lights work great on Predators like, Hogs, Bobcats, Coyotes, Fox, Racoons and more and for Bow fishing. Choose from various LED colors like red, green, white, and even infrared. 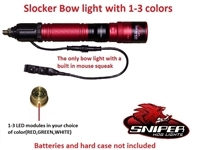 Improve your hunting accuracy with bow-mounted lights from Sniper Hog Lights today!